For those who believe Golf is more a religion than anything else-here is a lovely dedication to the game that they love and revere. A lovely sign board that will be cherished by anyone whose love for the game is well known. 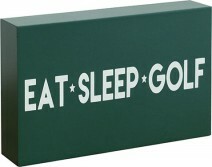 This sign board will help personalize your space and make your love for the game as pronounced as can be-it says in rather simple three words what is perhaps the most prolific of statements-Eat-Sleep-Golf! Be the first to review “Eat Sleep Golf Sign” Click here to cancel reply.